People from Minnesota laugh at our winters. Why do we do that? Project our reality onto other people. If you live in Minnesota, you better learn how to deal with a frigid and dominating winter. If you live in Charleston, SC, two days below freezing is a damn ice age. It actually snowed in January of last year. I grew up north of here and I’ve never experienced snow like that. Six inches of snow that turned into ice. The city was frozen for a week. I walked to the grocery store down the street and was almost killed by a car sliding off the road. I didn’t leave the house again until it thawed. You could hear the people from Minnesota laughing at the Charleston “snowpocalypse” clips on the weather channel. Everyone in northern states loves a good southern snow storm so they can make fun of how unprepared we are. It just reinforces their stereotypes of us. Fine because we have some pretty good ones about them. We can’t drive in snow and ice because we never have to. A few weeks before the snow it was 65 degrees on Christmas Eve. I’ve always said if I need to use a heater to get my car battery warm enough to start my engine, I will only do that once, pack whatever fits into the car and hightail it south as fast as I can. I’m proud of my novice snow driving because driving in snow and ice stinks. I think snow is pretty for a day and then I’m ready to say goodbye. Enough already. Last year, snow piles in Boston were still around in June. Oh, the superiority. If you live in a place that is stunningly beautiful and pleasant in the spring and fall like Charleston, winter is a real burden, even if it is mild. The short days and gray skies are like a sedative for the population. People are less happy, a little fatter, sun deprived and tired of being inside. Occasionally a 70-degree day will pop out of January and we all become like escaped inmates. We had one of those days this year and I went outside and stood in some sunlight for about thirty minutes. It’s a real weather tease. Humidity begins to build in the spring. In the early morning, it lays across everything like streaks on a freshly washed window, slowly disappearing. Green returns to the marsh grass. Color creeps up the spartina stalks beginning in late march. I actually think it is prettiest when the grass is half brown and half green. Spring happens underwater as well. 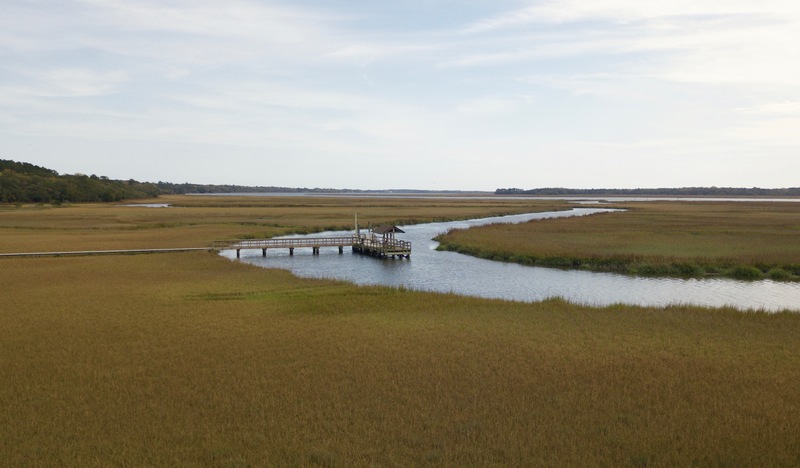 Nutrients return to the marshes fed by the Ashley and the Cooper rivers. That brings mullet and shrimp that bring bigger fish and so on. Winter water is a pretty aqua, but it is also dormant. When marsh water is dark with mud, it is alive. Life pops and flips throughout. Winter is hard under water. Food is scarce and the water is clear making it tougher to hide from dolphins. Fish from Minnesota wouldn’t stand a chance. I would not drive around Charleston during the first week of spring. People are delirious, gray-eyed, like they haven’t completely awoken from hibernation yet. I imagine when a grizzly emerges from her winter sleep, she is also ravenous and irrational. We are starved for sun and pleasantness. The winter sun is lower in the sky and most of its rays go right over our heads. The summer sun shines down on us like a cop interrogation scene from 80s television. The spring sun is gentle, friendly. The spring sun gets inside the house as well. It turns the shades burnt orange as it breaks the horizon. Then, it paints everything a soft yellow as the day moves on. Charleston isn’t a sports town. It is too nice in the fall to bother with football all the time. We watch, but we aren’t fanatics. Your team stinks? Let’s play nine. College basketball has a presence here. The College of Charleston has a great mid-major arena right downtown. We enjoy sports with an eye outdoors. We can just as easy listen to the game on the boat. Worlds are never as in sync as they are when it is beautiful at The Masters as well as out your window. The green of the fairways of Augusta National seem to spread from the TV into your living room and beyond. We also love March Madness. Not because we are rabid fans but because we love excuses not to work. If you have business in Charleston on a beautiful spring Friday, you better get it done before noon. Spring in Charleston has some flaws. No-see-ums will ruin a pleasant morning. Female no-see-ums have to feed on your flesh so they can have the energy to reproduce. Males don’t bite. Metaphor all you want. No-see-ums are warded off by wind and the hot sun. Early morning and late afternoon hours can be torturous if you get into a swarm. The worst thing they do is bite your scalp. The bites raise huge welts on me because I’m allergic. The welts don’t last long but they are itchy and painful. I always think about the days in the south in the past when working and living in the marsh must have been almost unbearable. I’m sure they had some no-see-um remedy that was a solid lead salve or something equally as deadly. I wish they had passed it on to us. Lead poisoning might be preferable. Springtime ushers in abundance. Tourists come and spend their money. The city is teeming with life again. Farmers markets begin. My health and my mind are both benefited by weekly farmers markets. I’m not sure I have grasped their privilege yet. Lots of places struggle to get fresh anything, even in summer, and here we are with a weekly cornucopia. Blueberries are my favorite. There’s a farm in Awendaw that specializes in growing them. I think they grow the best blueberries you can buy anywhere. I do not believe there is a prettier place on earth than Charleston in the spring. I try not to take it for granted; to enjoy as much of it as I can. Don’t worry Minnesota, spring will come to you as well. It will be summer down here by then. Hang in there. Come on down if you are feeling restless. The weather is fine.